In between state and society, there is the individual. In between China and the world, there is Hong Kong. Between the voice and the mouthpiece, between the pen and the sword, there is courage. China has said it will not allow open nominations for candidates for the leadership of Hong Kong in landmark 2017 elections. The announcement could trigger further large-scale protests in the city. SCMP report: HKU Vice Chancellor: We support freedom of speech and we support staff and students to express opinions whether they are in favour of Occupy Central or against. China says foreign powers need to back away from getting involved in Hong Kong’s political affairs. It comes ahead of a Beijing ruling on the governance of the semi-autonomous city. Demo: Speak Up, Take action. According to Nicolas Bequelin of Human Rights Watch, “The rule of law in Hong Kong has eroded faster in the past few months than it had over the whole period from 1997 to 2014.” And there are probably two main reasons for this. Consolidating his power after almost two years in office, President Xi Jinping has spoken of the need for a firmer hand with Hong Kong, partly out of concern that allowing greater democracy there might lead to demands for the same in other parts of China. The regime has also been caught off-guard by the strength of the campaign for democracy known as Occupy Central with Love and Peace, which participated in a huge march on July 1, the anniversary of the handover. The cost of defending the plutocrats is high. A Chinese government white paper released in June appeared to raise doubts about the continued independence of Hong Kong’s judiciary and the city’s commitment to the rule of law, which have been pillars of its success. 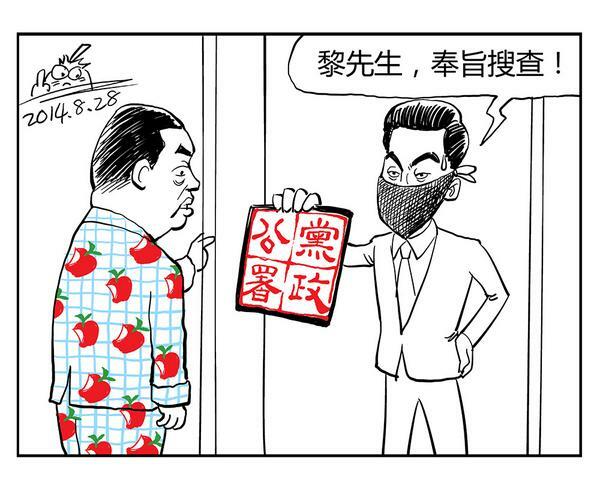 Raids this week on high-profile opposition supporter Jimmy Lai were hardly more reassuring. While democracy activists may not be able to shut down the central business district, as they’ve threatened, even low-level protests will draw weeks of unwanted international attention. Moderate Hong Kong parliamentarians say they won’t support Beijing’s proposals; as a result, they may fall short of the two-thirds majority needed to pass the local legislature. Sooner or later, Chinese leaders are going to have to get more comfortable with the idea of autonomy in outlying regions. In Xinjiang, which has been battered by a series of vicious terrorist attacks, the suppression of moderate voices has only enhanced the appeal of extremist groups. Hong Kong should have been an ideal test case for greater openness — a stable, ethnically Chinese enclave that is, yes, more interested in making money than in making trouble. So far Beijing is failing. In the past, Hong Kong has usually had moderate politicians, reasonable media voices and neutral bureaucrats and business people with the wisdom and good humour to maintain some basic cohesion. Even after the Article 23 uproar, or Donald Tsang’s anti-democrat tantrums, some sort of civility returned. This time feels different. In its attempts to assert control, Beijing has polarized the city, and it looks permanent. If they’re going to use law enforcement agencies for political persecution stunts, what’s the point of being moderate and constructive? Maybe Beijing will realize its tactics are overkill and counterproductive. Otherwise, the city is going to end up more alienated, more disgruntled, and less governable than ever. 据说香港廉政公署今天一大早把黎智英先生堵在家里，我觉得香港再继续赤化下去的话，廉政公署变成“党政公署”的那天也不远了。 I heard Hong Kong’s ICAC went to Jimmy Lai’s place early in the morning. I feel that if communist encroachment in Hong Kong continues, it won’t take long for the ICAC to become a CCP agency. It looks increasingly likely that some form of civil disobedience campaign will take place in Hong Kong in the near future. Political reform is now turning into a high-stakes game pitting the desires of significant proportions of the Hong Kong public, who wish for a credible democracy, against the might and coercive strength of the Communist Party of China (CPC), which is used to getting its own way, eventually. The principle of ‘one country, two systems’ has come full circle. These days Beijing is engrossed with the puzzle of how to handle Hong Kong, as universal suffrage demands pick momentum. The pro-democracy Occupy Central movement is out on the streets of the downtown calling for reforms and an electoral system that shouldn’t be censured by Chinese authorities. The issue is all about electing a new chief executive for the former British colony in 2017 through a popular vote. The fear that China will try to influence the outcome by screening candidates has stirred an unending debate. Activists want no restrictions on the nomination of candidates. The final decision, per se, rests with the National People’s Congress, which is in session in Beijing. It is widely believed that the politburo will not budge from its stated positions and would like the candidates to be vetted before they stand for public office in Hong Kong. The Congress also wants the new chief executive to be a ‘patriot’ and must not oppose the Mainland government. With such ifs and buts at work, the plenary session of policy-makers in Beijing will not be in a position to scale down soaring tensions in its offshore territory. Things as they stand seem to be heading towards a showdown as hundreds and thousands of activists are camping on the streets to force the authorities to accept their demands. If Beijing remains adamant on screening the candidates through a nominating committee, it will be end of the road for the hard-earned consensus that Hong Kongers had experienced since the historic transition. China has to take into consideration the fact that the world has changed for good, and it is no more the Tiananmen Square era where demonstrators can be crushed under the wheels of army tanks. China’s self-invented social media is more than enough to act as a bulwark against the dictates of communism.